Tamara Saffir who plays Luna tells us a little bit more about the character she plays and her favourite part of Luna. I play a character called Luna. She lives on the moon. She loves exploring, dancing and trying new things. What is your favourite part of Luna? It’s hard to choose a favourite part of Luna because I love all of it. One of my favourite parts is when Billy and Luna turn making the bed into a fun game. Billy has a favourite toy, Pig. What was/is your favourite toy? My favourite toy is a teddy bear called Bleah (I have no idea how I came up with that name). I have had her since I was a baby and she has travelled the world with me. 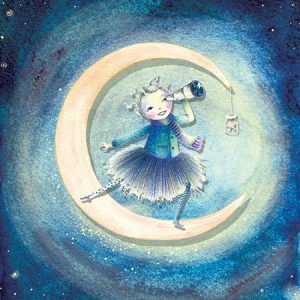 What message would you like the children to take away from coming to see Luna? That it’s great to be friends with someone different to you – it can open up new worlds. My first theatre experience was watching my big sister perform in her school plays. I was entranced from the first moment and I’ve been in love with the theatre ever since. Originally from Sydney, Australia, Tamara moved to London to train at the Royal Central School of School and Drama. Since graduating from the BA (Hons) Acting: Musical Theatre degree, she has worked extensively in theatre.